Models created within DYMEX consist of a series of modules, with each module responsible for a particular task. Modules use information from other modules as input, and supply information to other modules. DYMEX comes with a library of modules that can be incorporated into any model constructed with the Builder. Each module performs a specific function (for example, MetBase is used to read a standard set of meteorological variables from a file). Models created in the Builder can be opened in the Simulator within which simulations can be run. 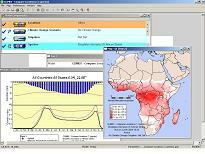 The results of these simulations can be displayed in tables, graphs and maps as well as exported to other programs. Models will normally be developed around one or more Lifecycle modules. Other modules provide data to the lifecycle modules, or manipulate lifecycle output in some way. Many modules have multiple uses (e.g. Function module) and may be used in several places in a model, while others are more specialised (e.g. the Soil Moisture module). Most modules receive input from another module or from an outside source. For example, the MetBase (Meteorological Database) module reads meteorological data from text files and provides the data as variables that can be accessed by other modules. DYMEX consists of two programs: a Builder and a Simulator that provide a user friendly platform on which to create and run population models. DYMEX has a graphical interface providing students and researchers with a simple means with which to build and run models in the Windows environment. Models and their components are presented in a way that is readily understood by ecologists. The models are created in a modular form, with each module dealing with a separate process, allowing great flexibility to modify or extend the model. DYMEX contains a library of user-adjustable modules, each of which performs a particular function. DYMEX comes with two comprehensive User’s Guides, step-by-step tutorials and an online Help system.